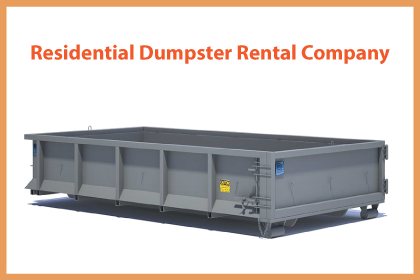 What is a Dumpster Rental Company? 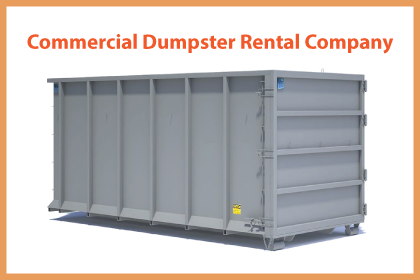 A dumpster rental company is an agency that has a fleet of trucks that deliver temporary and permanent dumpsters to clients homes and businesses. The trucks has special hook-lift or roll-off hydraulics systems that allow a container to be delivered and picked up as required. 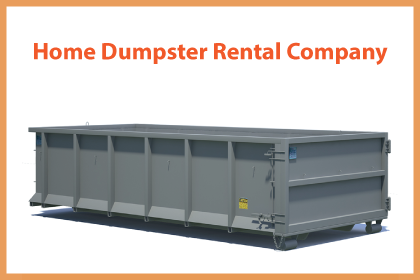 Some front loading dumpsters are simply emptied on a schedule by the dumpster rental company. Trash King is a dumpster rental company ready to help you with your dumpster needs. WHY CHOOSE TRASH KING AS YOUR DUMPSTER RENTAL AGENCY? We didn’t stick around in business for 45 years by providing subpar services. On the contrary, we have built a loyal customer base of contactors, roofers and homeowners who want exceptional customer service when they choose a waste dumpster rental company. We know that no matter how hard you plan and try to stick to a schedule things come up. This is why we have created our dumpster drop off or dumpster pick up guarantee. Simply call before 10am seven days a week and have your dumpsters delivered or even picked up on the same day. We cannot guarantee a time, but we will get it done. This service means that we have to keep an extra truck or two on the road but we believe that the added value to your business is worth the extra cost to us. The next time you find yourself with extra labor on hand and wishing you had pre-ordered a trash bin, give TrashKing a call and make use of that extra manpower. Hiring A Dumpster Rental Services Company Is Easy! Search online for a dumpster rental company or call Trash King to discuss your project. Describe your project and trash disposal needs to the dumpster company and choose a size that works. Pick a delivery date and time and where to place the temporary dumpster for rent. Load at your convenience and when full simply call the trash dumpster service to remove the bin and charge your credit card. What Makes A Good Industrial Garbage Dumpster Company? We know that both your shareholders, owners, employees and customers are all concerned about what impact your company has on the environment. With this in mind, and our own commitment to the environment, we only practice ethical disposal and recycling solutions. This includes choosing garbage disposal partners who are licensed, reputable and who innovate to find recycling solutions to divert materials from the landfills and help reduce your impact on the environment.... This means thousands of tons diverted from landfills and reducing the carbon footprint of both our service and your garbage service. Hiring A Trash Dumpster Rental Services Company Is Easy! Renting a dumpster has never been this easy. Trash King has the right size for your project- guaranteed. Just call Trash King and ask to speak with a specialist who can discuss your needs with you- they’ll recommend the right bin for the job and save you time and money. Don’t leave your project’s dumpster rental for the last minute. Make sure you have a centralized location where your driver will drop off your bin so that your cre...w will have convenient access to it, keeping materials and trash off of the ground where it will not only pose as a safety hazard, but will take more time to clean up after the project is completed. For more tips on renting a dumpster, visit TrashKing.ca or call our dumpster support team today. At Trash King we have one partner, Urban Wood Waste Recyclers in Coquitlam actually separates cardboard, wood and metal from your dumpster contents and re-purposes and recycles those materials. We can often recycle up to 80% of all waste from our dumpster rentals. This means that your waste is recycled, reused and diverted from the landfill, and that is a win for your organization, the city and the environment. – Trash King offers their recycle bins at all-inclusive prices, so you don’t have to worry about extra fees or costs added on to your quote; in fact the same price you’re quoted is what you’ll pay. With other dumpster rental agencies, you’ll get a low price quote when you call, then find out when it comes time to pay that you really didn’t save any money in the end. Check out the Trash King website and click on the ‘Bin Rental Quotes’ link for pricing, or contact a specialist who can provide you with assistance in selecting the right size bin at a great price. Choose A Dumpster Company Who Pro-Rates Their Tipping Fees! Disposal costs are a real burden to waste haulers and often represent up to 50% of the expenses for a dumpster rental company in. In an effort to keep your costs down, we offer pro-rated tipping fees on all of our dumpster rental services. Don’t settle for a disposal company that charges a block rate for their dump fees. This can cost you significantly in the end bill. Instead find a company like Trash King that offers dump fees prorated by the 100kg so that you are only paying fo...r what you use. So, if you only have 1.44 metric tons and your bin includes the first ton, then you will be charged for .44 tons only. Don’t be fooled by dumpster companies who charge in block amounts and round up for your convenience, choose TrashKing and get prorated dumpster tipping fees with every rental. – If you’re looking for flexibility, no one does it better than Trash King. Select your bin size from the very convenient 8 cubic yard mini bin to the 40 cubic yard bin for large construction projects. There are numerous options in between, including 10, 12, 15, 20, and 30 cubic yard dumpsters for rent from Trash King, making it affordable to rent the right bin for your needs. Check out the bins on the ...yle="color: blue;">TrashKing.ca website for precise dimensions and details regarding the bins. Book a waste dumpster bin for your upcoming renovation, construction project by calling us or connect over the website and someone will get back with you promptly. Make sure your project stays on budget and on schedule with a timely and affordable rental from Trash King for the most convenient disposal of your trash and other materials. Professional contractors agree that making your dumpster re...ntal a prime focus of your project is the best way to maintain safety on location and avoid the dangers of accumulated debris that can cause injury.